For 25 days this December daily gifts are coming down the chimney at Crazy Vegas Casino. December 01, 2013 (Press release) – The sound of sleigh-bells is carrying in the wind as tinsel and lights decorate homes and streets – it’s a special time of year but something extra special is happening this December. From 1 December until Christmas Day there will be daily rewards and Bonuses to unwrap at Crazy Vegas Casino. To get onto this list players need to look for the popup and activate the countdown. They will be able to join at any time during the promotion. After activating the advent calendar-style promotion, players will be given a sparsely decorated virtual Christmas tree. Every day a new gift will appear in the form of a box next to the tree with a decoration inside. 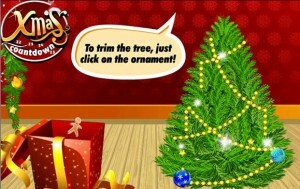 All players need to do is click on the decoration and drag it over to the tree and the gifts will spring to life. Gifts will include a percentage of all losses returned, enormous C-Buck rewards (loyalty points that can be redeemed for cash) on specific games, random C-Bucks giveaways and sleigh-loads of Free Spins. Each day there is something different happening and players will be rewarded for trying out new titles and getting into the spirit with a host of Christmas-themed Slots games, including Santa’s Wild Ride, Deck the Halls, Secret Santa, Ho Ho Ho, Gift Rap and more. For new players at Crazy Vegas Casino every day feels like Christmas with huge gift-wrapped Welcome Offers. They can choose between $/£/€3,000 Free in casino credits to play with in their first 60 minutes in the casino, with Winnings they can keep; or they can opt for $/£/€500 Free in Bonuses on their first three deposits. There are over 650 high quality games available at Crazy Vegas Casino, each developed by leading online gaming software developer Microgaming™. Convenience and safety are top priorities when it comes to banking and a range of trusted methods are available in numerous currencies, including web wallets, credit cards and direct bank transfers. In the event that a player has a query, there is a multi-lingual team of support staff available 24/7 to provide assistance. They can be reached by email, live chat or toll-free number.